Chile's Ministry of Tourism currently has a wonderful advertising campaign you may have seen on North American television. Chile is one of South America's most stable and prosperous nations which is quickly assimilating North America. Within Latin America it leads in terms of human development, competitiveness, political stability, globalization, economic freedom, low perception of corruption and comparatively low poverty rates, with high rankings for freedom of the press and democratic development. With this situation the cost of living is also comparable to North America. Each day, walking in Santiago was met with a new discovery: Parque Metropolitano has a mountainside zoo - home to 158 different species of animals (some cages were very nice but some were too small, dirty, and smelly from the heat – the poor misplaced polar bear ! 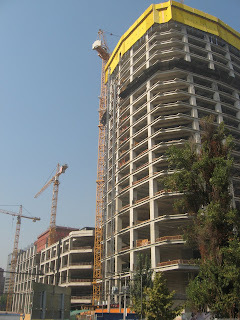 ); a modern & extensive system of metro trains; Costanera Centre construction cranes and activity; autopistas of Santiago; teleferico; Japanese & rose gardens; Funicular - an outdoor escalator / elevator with a capacity of 50 people in each car. 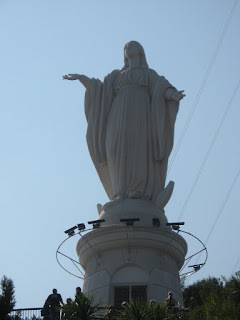 It travels 485 meters on an incline of 48 degrees and is the traditional system of access to the monument of the Virgin in the sanctuary of the Immaculate Conception; we dined in a typical Chilean restaurant with live music and cultural dancing. 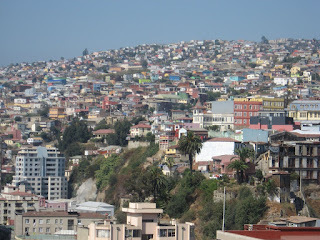 Valparaíso (Paradise Valley) an intriguing coastal seaport located in the centre of Chile is built upon dozens of steep hillsides overlooking the Pacific Ocean. In 2003 UNESCO has declared Valparaíso's labyrinth of streets, and cobblestone alleyways, with rich architecture a World Heritage Site. 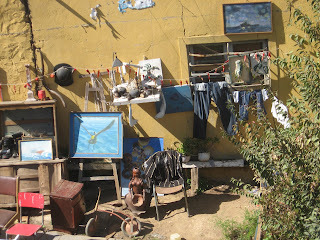 With it's picturesque harbour, Pablo Neruda (whose home we visited) immortalized the city as the "novia del oceano". With some 250,000 inhabitants it was known as " little San Francisco" and played an important role in the second half of the 19th century, when the city served as a major stopover for ships traveling between the Atlantic and Pacific oceans. It played a major role during the California Gold Rush. The opening of the Panama Canal was a major blow to the ship traffic and the city's economy. During the brief summer, there are many international cruise ships in the port, and it is a hub for freight containers, fresh fruit, copper, and wine. We enjoyed meandering through the myriad of steep cobblestone streets where often older, richly colourful buildings would appear perched in mid air overhanging steep cliff sides. The architecture has been influenced by many immigrant cultures and provides inspiration for architecture students from around the world. 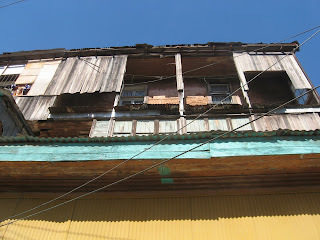 In addition to staircases which traverse the steep hillsides, Valparaíso has an unusual system of ascensores funicular elevators (highly-inclined cable cars) which are one of the world's 100 most endangered historical treasures, or the Polanco elevator where one enters a long dimly lit mine-shaft like tunnel, and then a traditional vertical elevator which lifts its passengers several hundred feet within the earth to emerge to a daylight exit near the mountain top. There we found an abundance of fine restaurants serving typical plates and folkloric music, and artesan kiosks. 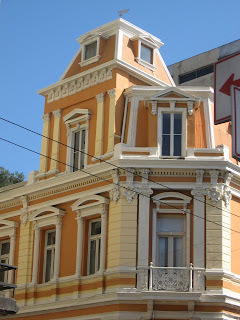 Although Santiago is the official capital, Valparaiso is home to the National Congress, and nine major universities. It is linked by a modern toll highway which has overpass stations which recognize a chip in each car and levy an incremental fee by electronic satellite depending on the distance traveled. There is no need to slow down or carry any money – you receive a monthly bill via mail. Latin American communities embrace life with an extensive variety of events and festivals. "Valparaiso Downhill" is a new mountain bike race, taking place in February that has bicycle racers compete down stairs and alleys - going from the surrounding hills down to the lowlands. At New Year's they have a famous festival of fireworks, the biggest in all of Latin America, attended by a million tourists who fill the coastline and hillsides with a view of the bay. Immediately adjacent to Valparaiso is the "Vineyard of the Sea" Viña del Mar a popular beach destination for tourists. 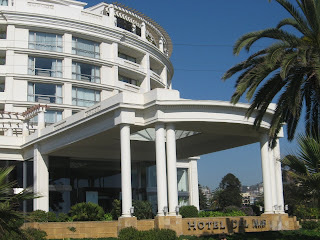 It is home to a famous casino Hotel del Mar and the Presidential summer Palace. We strolled along the extensive malecon from the flower clock, north of the Casino, to the Naval Armoury at the southern end of the city. Artists have designed a variety of life like sandcastle sculptures along the beaches and seek donations from the photos taken by the passing tourists. 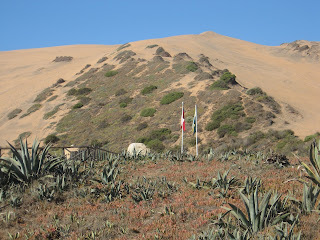 Large sand dunes lay opposite the ocean and provide a playground for ATV's, motorcycles, jeeps, and dune buggy's. 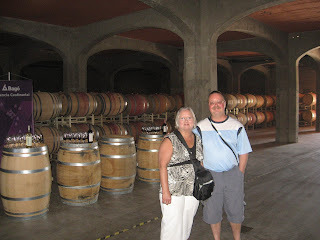 We visited a winery in the Casa Blanca Valley which was very similar to the cottage wineries in the Okanagan, or California. While there are many similarities to the cottage wineries of Napa & the Okanagan, it was very interesting to learn although Chilean wines have a strong international reputation they are relatively young vineyards (established in the early 90's). In this particular vineyard a helicopter is employed, just prior to harvest, in order to keep the " frosty " evening air from damaging the grape crop. The adjacent winery had permanent windmill fans to accomplish the same task. The innovative methods of dealing with a variety of challenges in Latin America are refreshing. 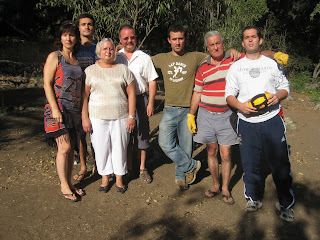 We enjoyed a weekend escape to the city of Olmue with the warmth & hospitality of Cristian's family. Olmue is a very popular summer country / mountain escape for the coastal people located in Mount La Campana a National Park. The family retreat was very quiet and relaxing, sitting in the yard by the pool, and listening to the birds, and watching the small lizards sun themselves. That evening we enjoyed the best fresh scallops around a campfire, lasagna, the music of a guitar, fine Chilean wine and a cool evening breeze. Reminiscent of a summer evening camping in beautiful British Columbia we talked until the fire embers died down. 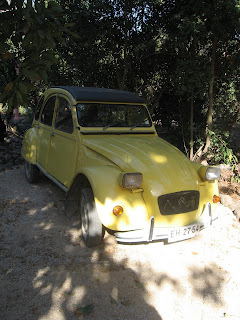 During the next day we toured the small village in Cristian's yellow circa 1970's Citroen convertible 2CV. This car is unique and a fairly rare collector auto in North America, but was fairly common here a decade ago. Apparently Argentina has a large association of Citroen 2CV owners / collectors. I always wanted one of these cars when I got big & grew up! Oh the appeal of cars with lots of character. Along the roadsides are country fresh fruit and vegetable stands, homemade jams & preserves. The following day it was a welcome & pleasant change to assist with gardening chores and yard activities. I'm a friend of Cristián. I really appreciate your comments about Chile, which are very accurate. 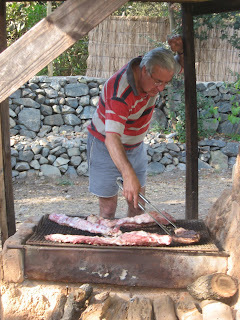 I hope that you had also have the opportunity to try Olmué's meat pies ("empanadas").